Don’t be confused that Samsung is calling its latest productivity phone the Galaxy Note 7. Samsung skipped the name Note 6 entirely because it wanted this latest phablet to directly align with its newest Galaxy flagships—the Galaxy S7 and S7 Edge—which bear many of the same components inside. But is Samsung’s sixth-generation productivity phone really such a bold leap forward that it deserves to skip a generation, if in name only? Probably not. It still delivers all the productivity and creativity features that make Note phones so great, but the Note 7 doesn’t feel like a revolutionary overhaul of the Note 5. 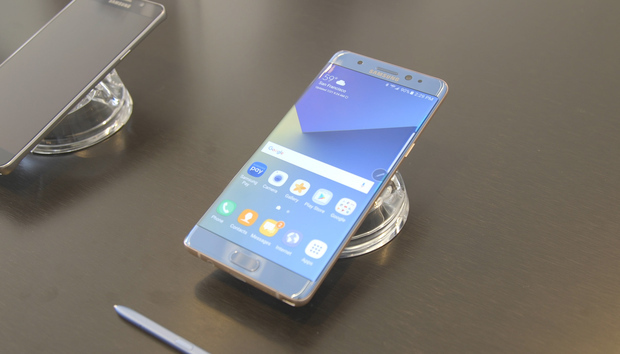 In the Note 7, Samsung delivers a higher-capacity battery, a better rear-facing camera, and an improved S-Pen. And that iris-scanning technology for unlocking the phone by gazing at the screen? It’s actually pretty impressive. So if you want to get things done and fuel your creative mind, you have to put the Note 7 on your short list. Just don’t expect any big surprises that reinvent the Note promise. The Note 7 is a stunning smartphone. It’s hard not to sound hyperbolic when writing about a Samsung device, but the Galaxy Note 7 is an absolute beauty. Like the Note 5, this year’s phablet features a metal and glass unibody design that’s styled in the familiar aesthetic of the Galaxy smartphone family. It’s also notably curvy with a display that extends down the sides, so you may confuse the Note 7 with one of Samsung’s Edge variants. Thin is in, and the Note 7 is definitely on trend. Need an expansion slot? It’s on the top of the device, along with the nano SIM slot. Samsung finally adopted USB Type-C for the Note 7, though it’s not compatible with Quick Charge 3.0. The Galaxy Note 7’s wider width and smooth chassis makes it one of the most comfortable phones I’ve held in a while—even more so than the half-an-inch smaller Galaxy S7. Samsung said it shaved off about 2mm of chassis while designing the Note 7, making the phablet no thicker than the Nexus 6P. That said, because of its large 5.7-inch screen size, the Note 7 may not be the right fit for everyone. Samsung offers a few software features that make it easier to use the interface and keyboard, but this isn’t an easy phone to use one-handed if you’ve got smaller hands. But, hey, at least it’s IP68 certified, so if it happens to slip out of your tiny fingers and into a giant pool, the Note 7 will be fine as long as you immediately retrieve it. The coral blue variant of the Galaxy Note 7 is one of the prettiest phones we’ve seen in a while. Unfortunately, this color will see limited availability. The edges of the Note 7 extend far down on either side. You might feel like calling this the Note 7 Edge. Since it’s built on top of the Galaxy S7’s hardware, the Note 7 features the same Snapdragon 820 processor, 4GB of RAM, Super AMOLED Quad HD display, and 12-megapixel rear-facing camera with dual-pixel technology. However, it does come with a 3500 mAh battery—a nice improvemenet over the 3000 mAh cell in the Note 5. The Note 7 is also the first Samsung device to use USB Type-C. We'll have to test to see if the USB-C charging spec is supported to charge the phone quickly from standard USB-C chargers. The Note 7’s display is stunning all around. The Note 7 will be available in a variety of colors, including silver, black, gold, and coral blue. Overall, the Galaxy Note 7 is a strong reminder of Samsung’s commitment to beautiful design, even if its specs and features are merely evolutionary. It’s a quality piece of hardware, and for many, all its productivity- and creativity-focused features will justify its high price. The S-Pen is still the best little smartphone accessory for anyone who needs to sketch and take freehand notes. The S-Pen continues to be a major selling point for Samsung’s phablet, and while it doesn’t look any different in the Note 7, it does deliver a feel that’s more, well, pen-like, thanks to a 2x increase in pressure sensitivity. In fact, I can see myself accidentally tossing the S-Pen into the pen cup on my desk, or losing it among the sea of Sakura Gelly Roll and BIC pens. It still has that satisfying clicky top, too. The S-Pen’s nub is intended to mimic the pen tip of a ballpoint pen, and here it’s better than ever. It offers a nice bit of resistance as you drag the tip across the screen, so artists and novice doodlers should be pleased. I could feel the difference as I sketched away in S-Note, and I can’t wait to use this device for scribbling my own notes. Life is better when you have a more pressure-sensitive stylus. The S-Pen’s Air Command feature is back, too. You hover your pen over the screen and click its side button to bring up this quick menu to various often-used app. In the new Air Command, Samsung consolidated the S-Note and Action Memo app into one item, and added an instant-translate feature to the menu. This new feature lets you translate individual words by simply hovering over them. Note that it doesn’t work with full sentences, so you’ll want to use Google Translate for demanding translations. My favorite feature of the Note 7 was introduced in the Note 5: the ability to write on the screen without unlocking the phone. If you need to take a note, just pop out the S-pen and start writing. The S-Pen is water-resistant, too, so you can take notes even when it’s raining. The TouchWiz UI still features a blue wallpaper by default, but everything else has been painting a grayish white. Samsung has had an uneven track record in making intuitive interfaces, but the Note 7 mostly gets it right. Samsung’s bright, blue-hued TouchWiz interface has been dialed down to a soft white-gray. It’s easier on the eyes and looks more modern. I also appreciate the Blue light filter option in Quick Settings that makes the display easier to read in dark environments. Most free third-party apps that provide this feature are riddled with ads, so it’s nice to have the native offering. TouchWiz’s new notifications shade is easier to look at. There’s now a Blue Light filter available in the Quick Settings menu. This makes it easier to see the screen in darker environments. The Note 7’s Edge screen lets you pin your favorite apps for one-handed access. The Note 7 comes standard with the Edge panel introduced in the Galaxy S7 Edge. It’s accessible via a peek-a-boo tab that hangs around on either side of the screen, depending on where you like it. You can have a total of nine different Edge panels, including a Tasks Edge (which adds shortcuts to oft-used tasks) and Apps Edge (which offers quick access to favorite apps). The Edge panels are supposed to make it easier for you to use the Note 7 one-handed, but they really only work if you train yourself to take advantage of the specific shortcuts. The Galaxy Note 7 features a Secure folder that hides away super secret files and apps. I’m not a fan of Samsung’s fingerprint scanner embedded in the Home button, but I love the Galaxy Note 7’s new iris scanning technology, which let’s you unlock the phone by simply staring at the screen. At first, I thought it would be hokey, considering my previous experience with the Galaxy S4’s Smart Scroll and Smart Pause features, which use eye-tracking to control interface navigation. But it’s really nothing like that. The Iris scanning is actually quite fast, and all you have to do is hold the phone up to your face to unlock it. You don’t even need to look at the camera. It’s faster than unlocking the Note 7 with your thumbprint, though it also unlocks any data and apps you might have stowed away in the phone’s Secure folder. This is a special folder where you can tuck away special apps, files, and folders that you don’t want to share with prying eyes. Samsung hasn’t named a price yet, but you can assume the Note 7 will be expensive—and it will still be one of the best deals around. It might not be a major improvement over the Note 5, but it offers so much more than other smartphones in its price class. It’s got high-end specs, a camera that puts every other phone to shame, and a pressure-sensitive stylus that reminds us why this seemingly antiquated smartphone accessory can actually be quite helpful. The Note 7 isn’t just for the productivity-minded types, either. Artists and creative types who rely on sketching out their thoughts can get their fill on this 5.7-inch device. The phablet will be available later this summer on all four major U.S. carriers. And as soon as we get a review unit, we’ll get cracking on a review.